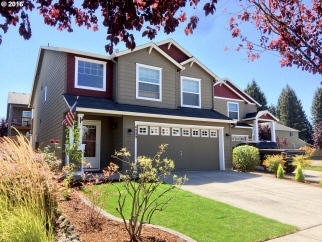 Beautiful Move-in Ready Home: Cool, Bright & Spacious with AC. Laminate Flooring Throughout Main Floor, Great Room Floor Plan. Sparkling White Cabinetry in Open Kitchen, Ceiling Fans in Bedrooms, Upstairs Laundry, Master Suite w/Balcony, Jetted Tub, Two Sinks. Office/Bonus, Nice Patio Space & Landscaping w/Blueberry, Raspberry, Cherry Trees & Grapes. Community Pool, Clubhouse, Gym, Park. Located btwn Costco, Chucks Produce, I-205 & I-5.